There is something so theruptic about knitting. AmIright?! When I sew a garment I usually have a deadline in mind and I sew like a madwoman until it's done. The great thing about knitting is it's a slow paced project. Once you accept that, you surrender to the fact that it will take a while and enjoy the slow rhythm. That is of course unless you make a mistake and have to undo (tink) your stitches and then you are consumed with burning, burning rage. Just another reminder that I'm not quite evolved yet as a peaceful human. These two projects are the result of many couch sessions with a cup of tea and a napping baby. It was great to have a creative project in the early days of newborn-ness to distract my brain from how sleep deprived I was. This awesome pattern is called 'Julissa' and it's by Vanessa Smith whose babe-ness is off the CHARTS! This pattern has two versions and the one I made is the scoop neck version. You can check out the high neck version here. 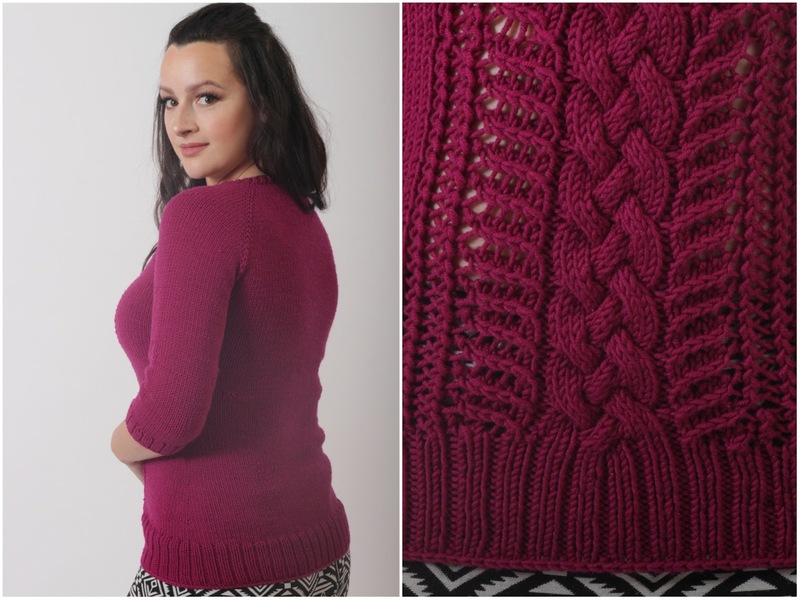 I fell in love with this pattern because the shape was modern and flattering, and I LOVED the detailing of the cable pattern down the front. The pattern calls for a 10ply/worsted weight yarn. I made mine with Milamia's new aran yarn in the colour 'Magenta'. The yarn is 100% merino wool and the yarn is so soft, the twist so glossy and tight and the colour so saturated that I just don't even know how to DEAL! It's just a dream yarn. I WANTS ALL THE COLOURS! I purchased my yarn from the fabulous gals at Woolarium who know everything there is to know about knitting and yarn and are extremely helpful. This pattern is knit in the round which at the moment has to be one of my favourite ways to knit. It makes it so much easier for beginner knitters like me to finish a garment neatly because there are no pieces that you have to sew together. It is knit from top down which is also a great advantage for beginner knitters trying to get the fit right as you can try it on as you go and see if any changes need to be made. 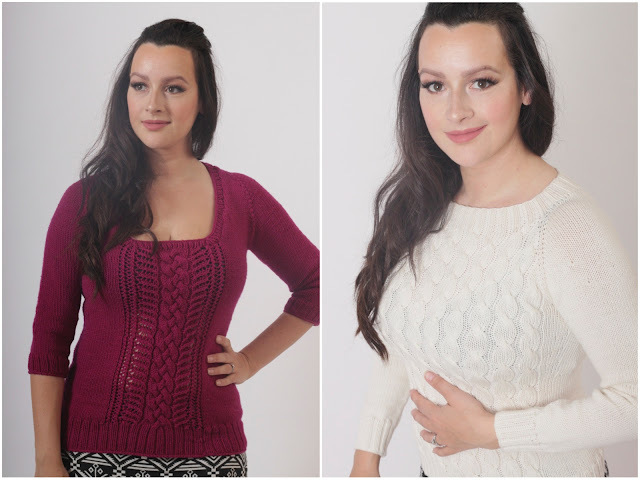 The sweater has waste shaping for a flattering fit and sits low on the hips which is great for all body types. The sizes range from 2X-small to 3X-large. I made my version in a small. I added a few more waist decreases than the pattern called for (one of the benefits of being able to try it on as you go!) and made the bodice slightly longer. I also shortened the ribbing along the waist band slightly as I didn't want the long top to overwhelm my short torso. As I was one ball of yarn short of what the patten called for, I decided to save yarn by making the sleeves in a straight stockinette stitch instead of the cable pattern. This is also a good call for ladies who are slightly self conscious of their arms as the cable stitch will add bulk. This pattern is called 'Shifting' by Justyna Lorkowska and it's another beautifully knit pattern. It is another seamlessly knit sweater knit in the round from the top down and features a repeated cable pattern down the front of the bodice. This top is also made with beautiful Millamia yarn but in their original sport weight/5ply yarn and made in the colour 'snow' which is an off white. 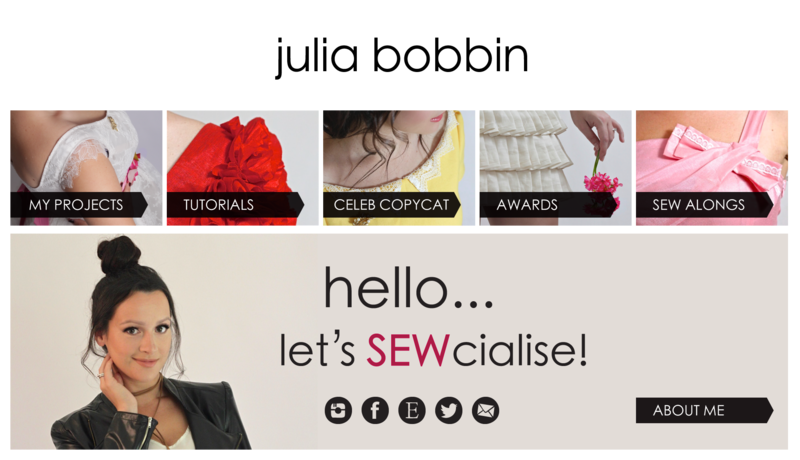 It is 100% merino wool and it is so soft and luscious that you just know you're knitting with superior quality. It's one of those yarns that you can't help but rub your face into. The bodice also has waist shaping and is knit from the top down. The sizes range from XS to XXL and I made mine in the small. The instructions for this pattern are wonderful! I did a full bust adjustment and the instructions included the method on how to do this. I made the bodice shorter than the pattern called for and it could have done with the extra length, but it is nice to have a shorter top to go with some of my fuller skirts. I really enjoyed making this pattern and learning some new techniques. I'd love to make this again in another colour and I'll make it longer in the bodice. 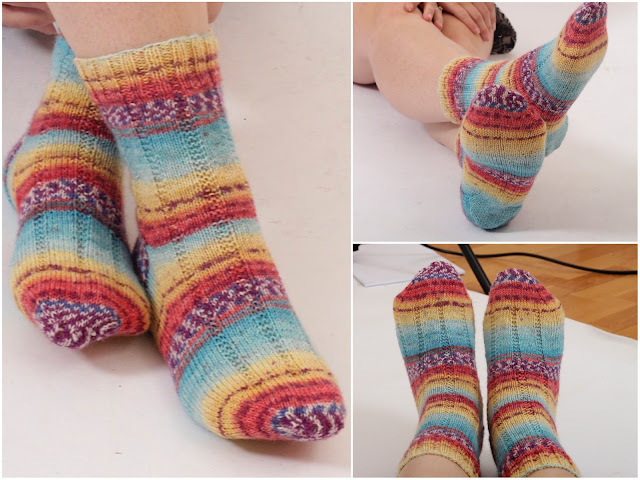 I have to quickly share a speedy little project I made recently too ... these gorgeous socks! The pattern is called 'Vanilla Latte Socks' by Virginia Rose-Jeanes and they were ridiculously fun to make! I knit them in the round using the magic-loop method (so much magic!) from top to toe. I was absolutely fascinated with the engineering of these socks. How you can get your needles and yarn to make a heel and a foot with just simple stitches; so clever! I'm officially a sock knitting convert! I made them using Opal sock yarn in Sweet and Spicy 2 - 8613 Zuckerstreussel because there is NOTHING more gorgeous than this pattern combination. Whenever I put on these socks I sit and have to will myself not to take a zillion photos of my feet and send them to my friends because they are just so cheery and playful. Clearly I like knitting cables and now socks! What about you? What's your favourite thing to knit? Next up on my needles is this gorgeous sweater cape - in-between sewing projects of course! Thanks Nathalie! Don't worry, it's easy enough to learn! I only started knitting a few years back and I didn't have any prior knitting knowledge. But once you get the hang of the basics it's really easy to pick up the rest! Looking GREAT ! I love your style. I'm convinced : Julissa will be my memade sweater of the season ! Oh it's so fun isn't it? And I think that socks have to be one of my favourite things to knit, even if they aren't as fun to wear as a sweater, but they are never boring to knit and take hardly any time! Those sweaters look AMAZING on you, and are so classic. Adding those to my list! My goodness you are a fantastic knitter! Your projects are absolutely perfect! Love them!! So pretty! I have Shifting in my Rarely queue but have yet to make it...and as far as sleeves go...I feel you. I hate them! But I recently completed Stonecutter that was knit in pieces and seamed (and the sleeves were knit flat) and honestly I like it so much better! You don't have to deal with all of the flopping and shifting of sweater bulk. These all look great! With a 2.5. year old and five month old I've been doing much more knitting than sewing lately, as it's much more portable and napping baby friendly. I just looked through Vanessa's patterns, and she's got some really nice ones!